Western blot analysis of extracts from NIH/3T3 cells, untreated or PDGF-treated (100ng/ml, 20 min), using Phospho-S6 Ribosomal protein (Ser235/236) (91B2) Rabbit mAb (upper) or S6 Ribosomal Protein (5G10) Rabbit mAb #2217 (lower). 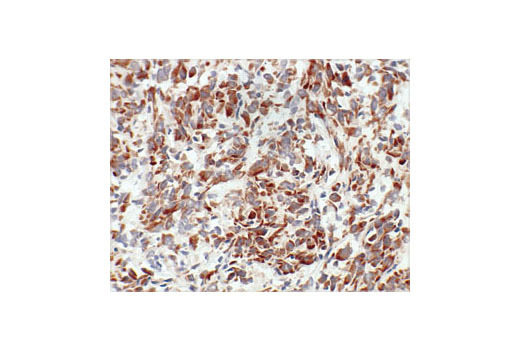 Immunohistochemical analysis of paraffin-embedded human breast carcinoma, using Phospho-S6 Ribosomal Protein (Ser235/236) (91B2) Rabbit mAb. 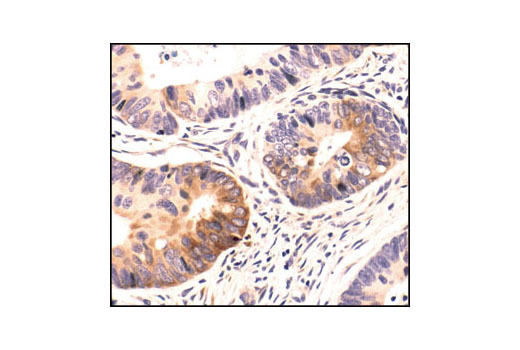 Immunohistochemical analysis of paraffin-embedded human colon carcinoma, showing cytoplasmic localization, using Phospho-S6 Ribosomal Protein (Ser235/236) (91B2) Rabbit mAb. 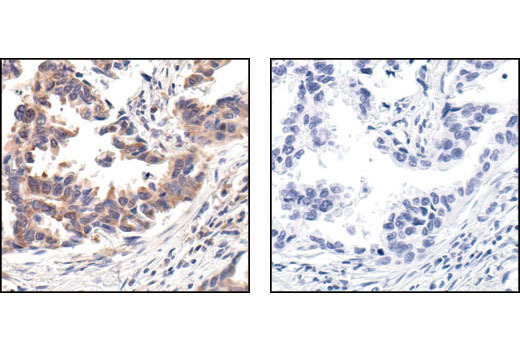 Immunohistochemical analysis of paraffin-embedded human lung carcinoma, using Phospho-S6 Ribosomal Protein (Ser235/236) (91B2) Rabbit mAb in the presence of control peptide (left) or Phospho-S6 Ribosomal Protein (Ser235/236) Blocking Peptide #1220 (right). 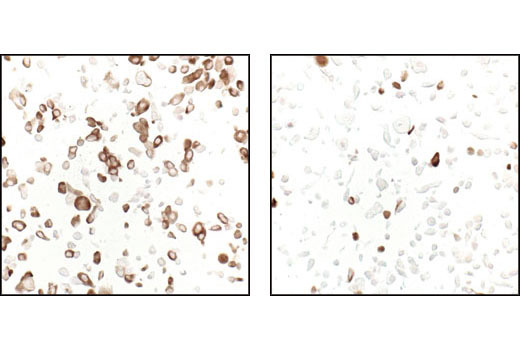 Immunohistochemical analysis of paraffin-embedded LNCaP cells, untreated (left) or rapamycin-treated (right), using Phospho-S6 Ribosomal Protein (Ser235/236) (91B2) Rabbit mAb. 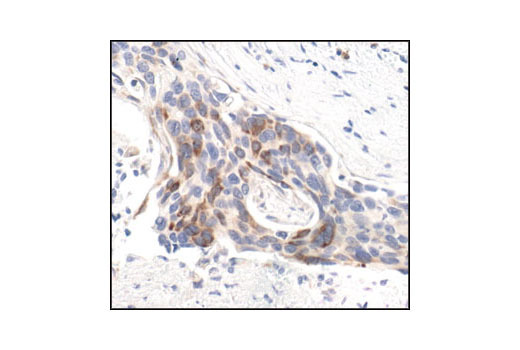 Immunohistochemical analysis of frozen U-87MG xenograft, showing cytoplasmic localization using Phospho-S6 Ribosomal Protein (Ser235/236) (91B2) Rabbit mAb. 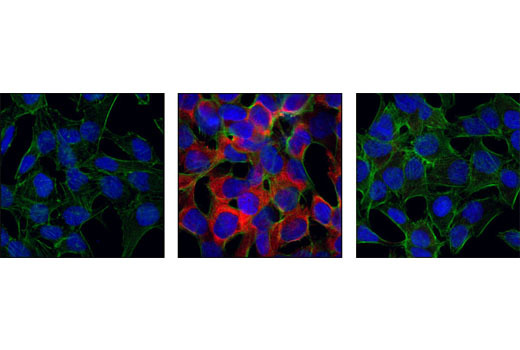 Confocal immunofluorescent images of HeLa cells serum-starved for 20 hrs (left), 20% serum-treated (center), or 20% serum-treated after preincubation with Rapamycin (FRAP/mTOR Inhibitor) #9904 and labeled with Phospho-S6 Ribosomal Protein (Ser235/236) (91B2) Rabbit mAb (red). Actin filaments have been labeled with fluorescein phalloidin. Blue pseudocolor = DRAQ5™ (fluorescent DNA dye). Prepare Vector® NovaRED per manufacturer's recommendations. 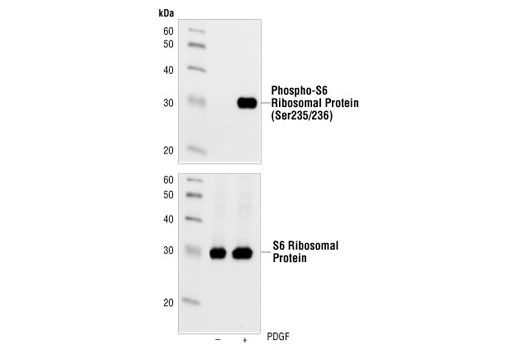 Phospho-S6 Ribosomal Protein (Ser235/236) (91B2) Rabbit mAb detects endogenous levels of ribosomal protein S6 only when phosphorylated at serines 235 and 236.